As the resident MMA junkie here at AppAddict.net, it falls on me to tackle this challenge. 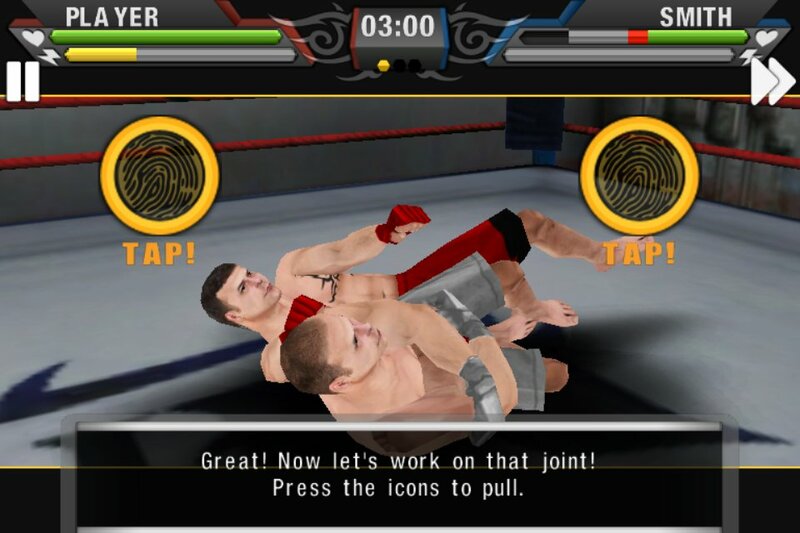 Two different Mixed Martial Arts games recently hit the app store, and I pounced on the chance to try both of them out. Sadly, neither is worth the price of admission…yet. Below I compare some of the aspects of each title including the fighters, gameplay and modes. UFC is leaps and bounds above all other MMA organizations when it comes to brand awareness. You are much more likely to have heard of the UFC when it comes to this sport than you are to have even heard that the sport is called MMA. It’s like the concept of Band-Aids vs adhesive strips or Roller Blades vs in-line skates. All of the fighters on the UFC® Undisputed™ 2010 game are very well-known names, while MMA by EA SPORTS™ features only two or three fighters that people who aren’t die-hard fans will know. UFC Undisputed features five different weight classes and five fighters in each class (oddly, current champs are missing like Anderson Silva). EA’s MMA features 24 fighters in several weight classes (you can mix and match weights with no drawback in exhibition mode). While the total number of fighters is the same, having recognizable names gives a huge point to UFC. I’m a die-hard fan and I don’t even know all the guys on EA’s MMA game. 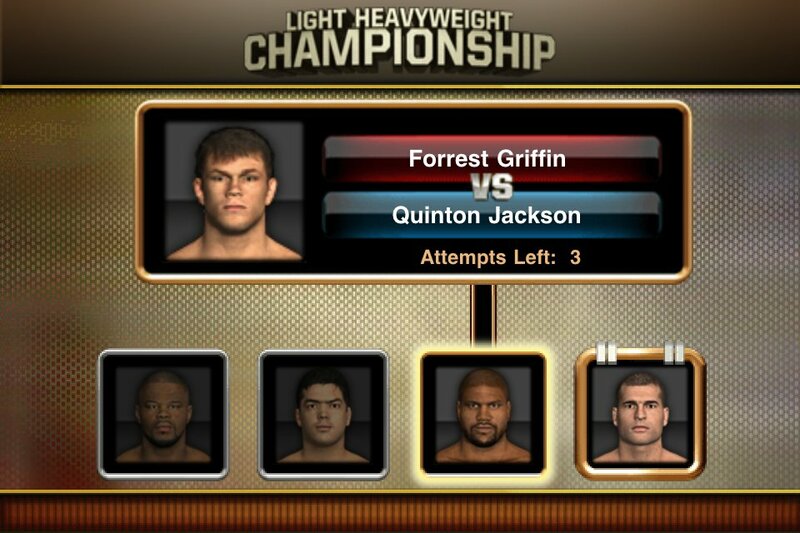 Both games feature a career mode, although UFC Undisputed‘s leaves much to be desired. On Undisputed, the career mode consists of picking a weight class and one of the five fighters in it. You then fight the other four fighters in your class with three chances to beat each of them. If you beat all four, you get the belt. That’s it. I found it very amusing that it only shows you the current fighter and the champ before your match, with the other fighters covered by question marks. It’s not like you have to guess who you’ll be fighting since there are only five guys available. 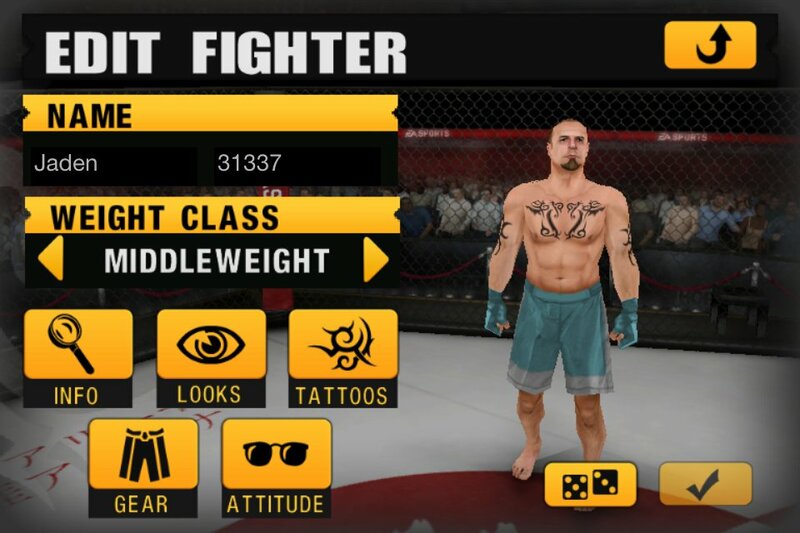 MMA’s career mode is much more detailed, allowing you to create a fighter (of reasonable customization), then train for your fights around a calender system. and finally, fight your way through the ranks. Since for some reason there are no weight restrictions, you can fight just about anyone. Due to reasons I’ll get into below, I have no idea what happens at the end of this mode, but it’s clearly more robust. UFC Undisputed went with fairly normal controls. You have a directional pad that allows you to step forward, back, do take-downs, and get off the ground. There are separate punch and kick buttons, and if you slide across those buttons, you’ll do stronger attacks. The movement is a bit jerky, as you can’t walk forward– you only take a single step at a time. To hit a take-down, you have to press the down arrow while close enough, then tap the screen quickly. When you’re close enough, a clench button appears above the D-pad to work the clench. While on the ground, you’ll work a dial to change positions, and control a strike button (for fists and knees). When a submission opportunity opens up (which is fairly random, as far as I can tell), you can press a button for it. To finish your opponent, you have to trace a squiggly shape before the meter at the bottom runs out. Based on who is more skilled in submissions, you can get easy shapes or very intricate ones. Go out of the lines once, and you fail. This is also how to defend a submission. Overall, the gameplay is pretty good, but still needs a lot of work to tighten up. For MMA, Electronic Arts went with completely unique controls that drove me absolutely batty. 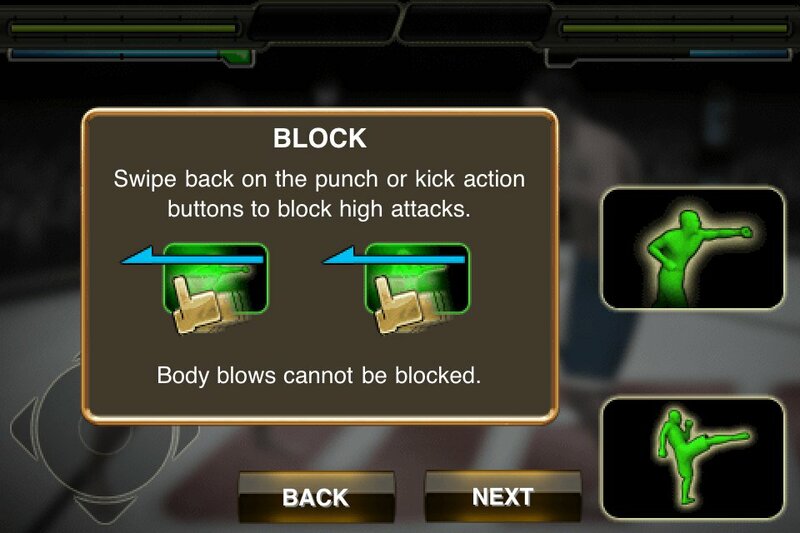 You tap for most attacks (high on the screen for punches and elbows, low for kicks and knees), sliding across the screen for heavier attacks. To perform clenches, takedowns, and submissions, as well as movement on the ground, you have to memorize several two finger gestures. Best I can recall, two fingers down is a takedown, two fingers toward each other is a clench, etc. This is a nightmare to remember, and very odd feeling. While I finished a few exhibition fights with established guys (all by knock-out), I never finished a single match with my custom character because I just couldn’t remember how to do any submissions, and he was set up to be a submission expert. These controls are just absolutely impossible. To make matters worse, the game feels like it’s turn based. While you can smoothly walk by tilting the device, every move you or the other fighter does has to wait to see if it can be countered before it happens. This really removes you from the moment when you try to slide in for a takedown, see your guy lunge in, then have to wait half a second or longer before either he completes it, or the other guy pushes you off. UFC Undisputed has a few other perks to it. Not only does it feature Game Center achievements, it’s a universal app (iPhone and iPad) saving you a few bucks. Inside the game you can also find stats on every contracted UFC fighter whether they’re in the game or not, and you can look up Pay-Per-View schedules and vote on who you think will win upcoming fights. There’s also a link to the UFC website. MMA by EA SPORTS™ has achievements, but they’re all in-game and don’t sync to any service like Game Center or OpenFeint. MMA does have one additional mode called Challenges where it puts you in matches and charges you with winning in specific ways. Overall, neither game is great, but UFC® Undisputed™ 2010 is much closer. If THQ would add more fighters, I’d be a lot happier. EA’s MMA, on the other hand, seems to require a complete rewrite to be even close to playable. If you’re a die-hard fan, like I am, and just have to have some kind of Mixed Martial Arts game on your iOS device, I’d have to recommend UFC® Undisputed™ 2010 out of the pair. Happy gaming, and keep your shots clean, everybody.